Toyota's Aygo is a fresh addition to the city car market. It has the cool cutesy looks along with the expertise behind it of several established makers of small cars. #02#City cars aren't new. The original Mini that arguably started it all 50 years ago hasn't been dead all that long and modern interpretations such as the Fiat Seicento have kept the flame burning. As small cars have grown so manufacturers find themselves with a gap to plug at the bottom of their line ups. Recently Peugeot, Citroen and Toyota teamed up to share development costs and produced their own city car as a group. Toyota's version, the Aygo is now a regular sight on our roads. 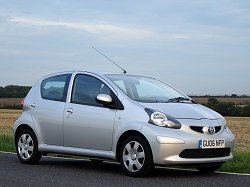 Advertised as the funky city car, the Aygo is clearly aimed at the youth market with the first time buyer, student or child of generous parents being the target. This is backed up by Toyota's sponsorship of what I call 'hangover TV', that is a collection of youth-orientated programmes shown in the UK on terrestrial TV on Sunday mornings; i.e. when most of the nation's 18-25 year olds are ensconced under a duvet with a thumping headache. The cheeky on screen looks of the Aygo are reinforced further upon first acquaintance in the metal. Despite the Aygo sharing the majority of its parts with the Peugeot 107 and Citroen C1, each manages to look different and bear their corporate identities clearly. 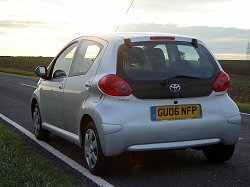 There are the appropriate family cues, but also some similarity with the Ford Ka, indicated by Toyota's extensive use of plastic mouldings to enhance and individualise the Aygo's looks, particularly at the rear where the bumper forms part of the wheelarch and most of the rear aspect of the car. 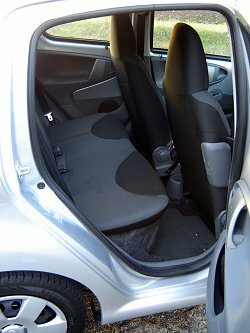 Inside the Aygo is basic, as you'd expect, but it's also roomy enough to house four adults and feels solid enough. The centre panel (back lit at night) houses the majority of the controls with a CD player perched at its top. The standard equipment isn't overly generous, but the list does include the essentials. Load capacity is adequate for a trip to the supermarket or a weekend away, but little more; certainly a suitcase would challenge it. The high load lip compromises practicality and the small parcel shelf doesn't help, as it won't lift high enough to open up the load area. The tailgate itself is glass and feels a little too flimsy for my liking, although of course it should never break. #p##02# A 1.4-litre diesel engine powered our test car and it is the perfect power plant for a small city motor like the Aygo. Ignoring the excessive noise (no doubt due to lack of sound deadening and the engine's proximity to the occupants' ears), it does a fine job. It summarily refuses to consume fuel; during the week with us we saw figures of around 60mpg, whilst providing the urge needed to keep up with the flow of traffic around town and dart into gaps. 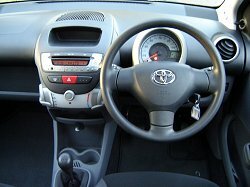 We also found that the diesel Aygo is more than comfortable on a motorway cruise; more so than the three-cylinder petrol alternative. 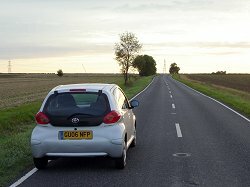 Given the 0-60mph time of 16 seconds quoted by Toyota it wouldn't be reasonable to expect anything other than lethargy, but in practice the Aygo never feels that slow or overawed by the demands of driving on the open road. The driving controls are perfect for town driving. The gearshift is light, quick and direct and the pedals are equally easy to use, well-spaced and weighted. The steering is heavier than that of most rivals, but still light compared to the majority of cars. The weighting actually makes the Aygo nicer to drive than some of the overly inert systems employed by rivals. All round visibility is very good making the Aygo a cinch to feed into tight spaces and its agility around town is second to none. What surprises is the alacrity with which it can cope with roads out of town. The relatively long-legged diesel helps and the chassis is perfectly capable of providing some entertainment on our twisty test routes. 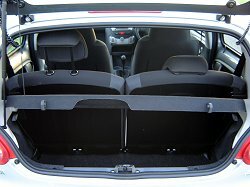 The Aygo's chassis provides a comfortable ride as well. Running costs are miniscule. 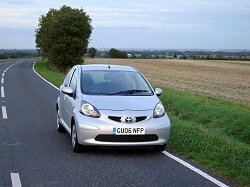 Along with its hatred of fuel the Toyota Aygo benefits from group 1E insurance and low road tax. It promises to be a painless ownership experience in every way.